You must be 21 years old to checkout the Sandhills' Finest. This week, Senator Tom Briese (our elected state sentator in the 41st District), introduced LB314, a bill designed to provide property tax relief for Nebraska landowners. While we are deeply sympathetic for the need to support property tax relief for Nebraska farmers and ranchers, LB314 proposed an increase of 345% in state excise taxes for Nebraska brewers. The proposal increases state excise taxes from $.31/gallon to $1.38/gallon to produce beer. That does not include the federal excise taxes we pay, state and federal payroll taxes, state sales and use tax, local property and personal property taxes, along with a myriad of other use fees to operate our business. So we did the math: Our average monthly production for 2018 was 1,291 gallons of beer. Our average monthly state excise tax bill was around $400. With this proposed increase, our tax bill would increase to $1,781.58. Instead of $4,800/year we pay in state excise taxes, this increase would put us on the hook for $21,379/year for state excise taxes! This proposal would make our state excise taxes the fourth largest monthly (and annual) expense for us at SBC behind payroll, rent and material costs. We are one of the most heavily taxed and regulated industries in America, and CURRENT Nebraska excise taxes on beer are already the absolute highest in the Midwest ($.31/gallon vs. $.08/gallon in Colorado vs $.02/gallon in Wyoming). We support property tax relief and believe action is long overdue to support our area producers. But to finance this relief by destroying one of the only bright spots in the rural Nebraskan economy right now is foolhardy. This unprecedented excise tax increase would severely limit our growth plans, jeopardize our operations and force us to consider serious increases in both the cost of our beer and our future expansion plans. This proposal would severely threaten our business’ existence to be blunt. Name a business that can incur a 345% increase in operational costs in a single year? You’d be hard-pressed to find a single one. We’re asking that you contact Senator Briese, and let him know that you DO NOT support a 345% increase in taxation on Nebraska brewers, who many are working hand-in-glove with Nebraska farmers to develop new commodity markets for grain (like us). This bill would destroy jobs and investment in both rural and urban Nebraska. You are able to contact Senator Briese here and please be civil. One last thing – why is it that the craft brewing industry in Nebraska has to continue to fight for its existence year after year after year in the state legislature? You would assume in a pro-business conservative state like Nebraska, elected officials would like to SUPPORT and ASSIST one of the most dynamic industries growing in the state. Industries that are adding jobs, investment and EMPLOYMENT in rural Nebraska. Help us spread the word, and fight this overreach. Thank you! In today’s installment of our Proudly Not Made By Robots feature, we’re talking about…me. I find it rather weird to write about yourself, so I asked for some help on writing this piece. My lovely wife, Christina penned the feature with my partner Mike offering input. Have a peek at what they had to say below. I appreciate your sentiments greatly! Today, we profile Caleb Pollard, a founding co-owner, in our Proudly Not Made by Robots feature. 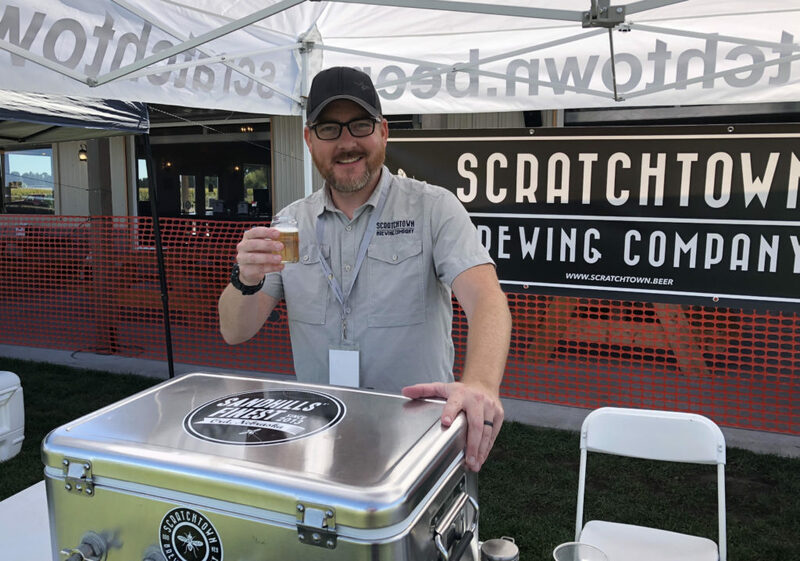 Caleb is the visionary, the passionate advocate, and President and Chief Mover of Units for Scratchtown Brewing Company. Originally from Nehawka, NE, Caleb’s roots can be found on a generations-old family farm. His love of family, land, and connection to community started there and has only grown over the last 10 years in Ord and while building Scratchtown. For the many who know Caleb (and Caleb has never met a stranger), you have heard his impassioned arguments about the power of rural; the importance of collaboration and community; and how every individual can make a difference when they choose to. For those of you who haven’t met Caleb yet, he would likely echo these sentiments when he tells you the story of Scratchtown. He would also tell you that Scratchtown has afforded him the opportunity and honor to pursue a dream with his three business partners (and their wives) that he will never regret. It has become a place where neighbors and friends can come together and break bread, our bread just happens to be beer. 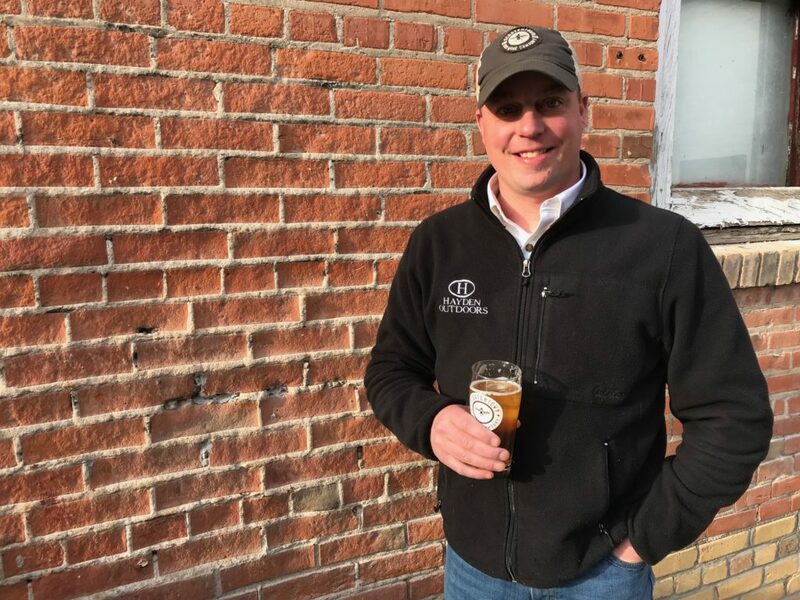 Caleb continues to grow Scratchtown by managing the operations end of the brewery, through marketing and sales, and developing collaborations and connections throughout the state. He is the glue that holds our SBC family together. He challenges each of us to be the best version of ourselves and will never stop dreaming about what is possible. His ambition, hard work and at times, sheer determination have helped build our brewery into something we are so proud to be a part of. What is your favorite SBC beer? Non-SBC beer? SBC beer = Favorite ever was the first bottled batch of Chardonnay barrel-aged Silver Tongued Devil Belgian Tripel. When Mike and I had the first taste after bottle condition, I had goosebumps. That was a magical beer. Non SBC=beer? O’Dell Friek when I’m feeling fancy, Miller High Life is my go-to everyday beer. Think back to your most memorable brewery experience: where and why? Most memorable was the day we received our license to operate. I spent the 2.5 hours driving home oscillating between emotional freak-outs (we don’t know what we’re doing!) and pure joy (our dream was coming true!). It was a roller coaster. But I knew we’d made the right move when I arrived – we had a taproom full of friends, family and colleagues waiting for us. The eruption of cheers and joy was incredible. What do you do at SBC? A little bit of everything, but now am focused more on operations, compliance, event planning and sales/marketing. I do my best to keep our production team and customers happy. What is your favorite SBC event? Our beer suppers. It’s been something I’ve wanted to do since before we started. Having Mel’s talents at Jubilee was the linchpin in making it happen. What is one hobby you enjoy in your free time? I LOVE to cook, and enjoy sourcing fresh ingredients to make delicious meals. I love to garden as a result and try to feed my family as much as I can from what I hunt and grow. If you had a year to go on an adventure, where would you go and why? I’d take an RV for a cross-country adventure through national and state parks across this great USA. I’ve always loved a good road trip story and would love to experience it with my wife, kids and dogs. Who is your favorite Star Wars character? Chewbacca. He’s a steadfast and loyal friend. What bit of advice would you give your 18-year old self? It’s okay if you don’t have your life figured out. You won’t when you’re 39, either! What do you like best about working at SBC? I sincerely love the atmosphere in our taproom. The dynamic we have with our local regulars and our out-of-town guests is incredibly unique. It’s a place I always hoped we could create and I am immensely proud of that. I also enjoy the smiles our beers put on our customer’s faces. I know I work with one of the most talented production teams in Nebraska! Welcome back to this installment of Proudly Not Made By Robots, our ongoing series about the people behind the business here at Scratchtown. Today you get to meet Jade, one of the original three founding partners here at SBC. Jade and I (Caleb) began to discuss the idea of opening a brewery in Ord all the way back in 2009. Nearly ten years ago, we spent many Sunday mornings together traveling the backroads of Valley, Garfield and Custer Counties contemplating our future in rural Nebraska, and ways we could build our community. We knew a brewery was a good fit and our intuition proved to be true. Jade was an essential partner in starting the company, and while he doesn’t spend his days here on the operation and production side, he and his wife Michelle continue to be important decision makers for the present and future prospects of the company. Let’s get to know Jade. Where did you grow up? Ansley Nebraska, USA. What is your favorite SBC beer? Non-SBC beer? Hot Iron American Wheat; Miller Lite. Think back to your most memorable brewery experience – where any why? First brew day at SBC. What do you do at SBC? Not much. I was involved heavily in the early days with construction and development. I work the taproom sometimes. What is your favorite SBC event? Food pantry fundraiser in May. Beef + beer = good times. What is one hobby you enjoy in your free time? Woodworking. If you had a year to go on an adventure, where would you go and why? Alaska. I would fish, hunt and explore. What bit of advice would you give your 18-year old self? Join the military and defend American values abroad. What do you want to be when you grow up? A good grandpa. What is your favorite thing to do in nature? Hunt or fish with my family and friends. What do you like best about working at SBC? Meeting new people, preaching the gospel of Ord and our area and giving back to the community.